See all the sights and experience the beauty of Niagara Falls with this overnight trip to the Niagara region from Toronto. This scenic tour includes one night accommodation at the Sheraton on the Falls hotel, overlooking Niagara Falls. Make a stop in Niagara on the Lake for a winery visit and tasting. Enjoy a buffet lunch with floor to ceiling windows overlooking the falls and take a ride aboard the famous Hornblower Niagara Cruise to the edge of the thundering waterfalls. *Substitute with Journey behind the falls when the Hornblower is not operating. After departing Toronto, sit back and relax aboard a deluxe, air-conditioned motor coach. Enjoy the most popular and historical sites of the Niagara region along the way. This tour offers complimentary pickups from selected downtown hotel in Toronto. During the drive to the Niagara region, the experienced Niagara Parks guide will discuss the most exciting highlights Southern Ontario has to offer. Make a stop at Niagara on the Lake, named Canada's loveliest little town and visit one of the local wineries to sample the Ontario's famous ice wines. Enjoy a nice Lunch Buffet at the Fallsview Dining Room in the Sheraton on the Falls hotel, while taking in the breathtaking panoramic views of Niagara Falls with floor to ceiling windows. Check out a natural whirlpool located in the Niagara Gorge, downstream from the Niagara Falls. Alternatively, take a helicopter ride for an additional charge. 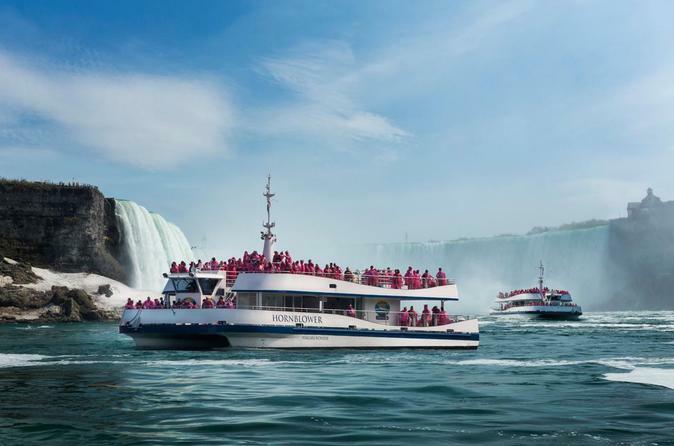 The best part of the tour, take a exhilarating ride on the Hornblower Niagara Cruise, which travels to the base of the thundering Horseshoe Falls. The tour concludes with a return trip to Toronto.